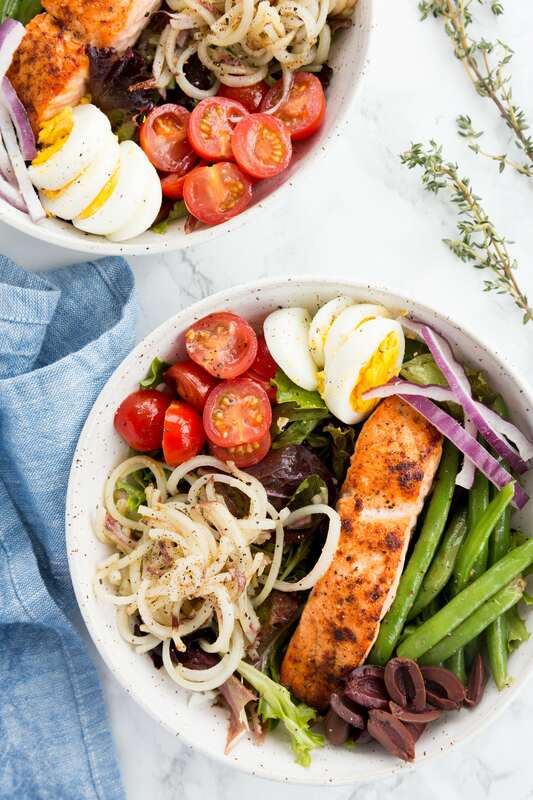 This salmon nicoise is a hearty salad that comes together quickly and is packed with flavor and veggies. The spiralized potatoes quick more quickly and are look beautiful in this gluten free salad. The nicoise salad is traditionally a French salad made of tomatoes, hard-boiled eggs, Niçoise olives, anchovies, and dressed with olive oil. If you order this salad here in America, it’s usually with tuna, potatoes, and green beans – a bit fuller! 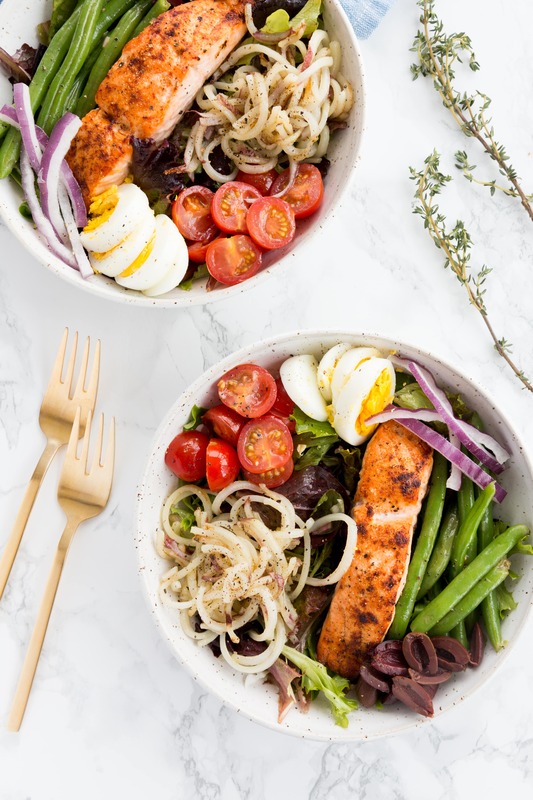 I love Niçoise salads, I always feel like I’m having a fancy, healthy, and filling meal. There’s so much flavor and crunch in each bite and it’s a colorful, nutrient packed meal. Talk about eating the rainbow! 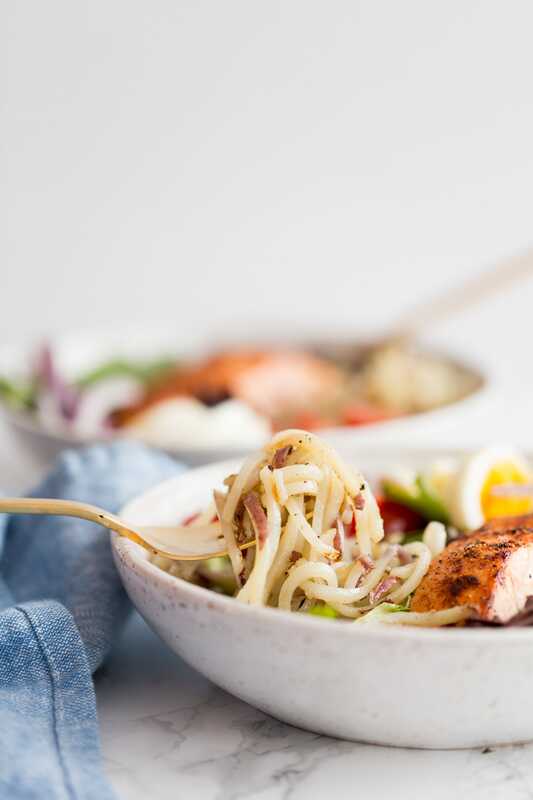 I’ve been obsessed with broiling my salmon ever since I made this Butternut Squash Risotto with Crispy Salmon, and so I decided to top my Niçoise with crispy salmon for a dose of healthy omega-3s. This is the perfect salad to make if you’re having friends over for lunch and want to prepare something pretty and tasty. The spiralized potatoes ensure more potato in every bite and they look extra special in this salad. They’re salty and add just enough starch into this salad. Bring a large pot filled halfway with water to a boil. Add the green beans and let boil until fork tender, 5-7 minutes. Drain into a colander and set aside. Preheat the oven to the high broil setting. Grease a small casserole dish or oven safe skillet with olive oil. Add the salmon in and season with garlic powder, paprika, salt and pepper. Place the salmon in the oven and broil for 10 minutes. ?Heat the olive oil in a large skillet over medium-high heat. Once the oil is shimmering, add in the potato noodles, season with garlic powder, salt, and pepper. Cover and cook for 7-10 minutes or until cooked all the way through, uncovering occasionally to toss. ?While potatoes and salmon cook, whisk all ingredients for the vinaigrette together and set aside. 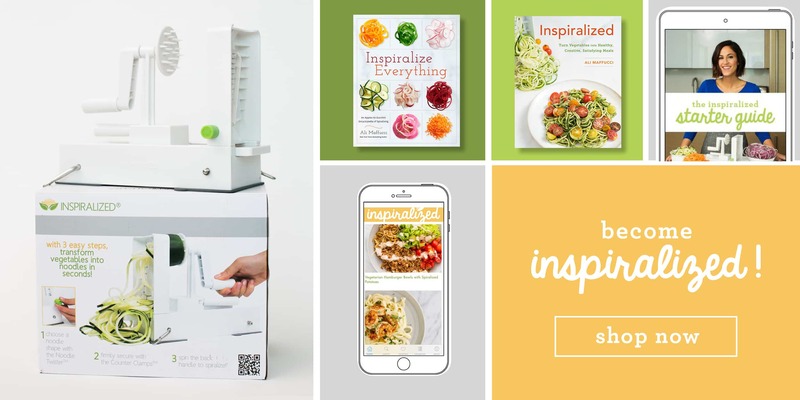 ?Assemble your salads: set down two plates or bowls. On both plates, set down the lettuce. Then, divide equally the green beans, potato noodles, boiled eggs, cherry tomatoes, olives, red onion, and tuna. Drizzle each with the vinaigrette and serve.